Prepositions of location describe where something is. Study the prepositions in the box below and select the correct preposition for each of the sentences according to the position in the map. 1. The drug store is next to between across from the police station. 2. The police station is next to between across from the bank and the store. 3. The school is next to between across from the restaurant. 4. 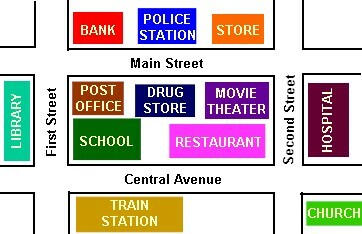 The drug store is next to between across from the movie theater and the post office. 5. The train station is next to between across from the school. 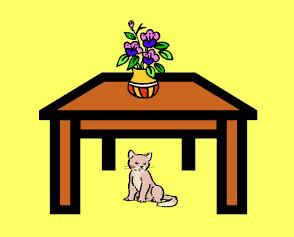 Study the prepositions in the box below and select the correct preposition to describe the position of the objects in the picture. 1. The dog is right left between above below in front of behind the sun. 2. The house is right left between above below in front of behind the car. 3. The tree is to the right left between above below in front of behind of the house. 4. The sun is right left between above below in front of behind the dog. 5. 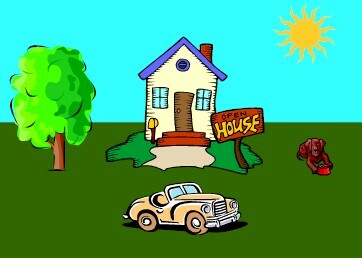 The car is right left between above below in front of behind the house. 6. The dog is to the right left between above below in front of behind of the house. 7. The house is right left between above below in front of behind the dog and the tree. Study the prepositions in the box below and select the correct preposition to describe the position of the objects in the picture below. 1. The vase is in under on the table. 2. The cat is in under on the table. 3. The flowers are in under on the vase. 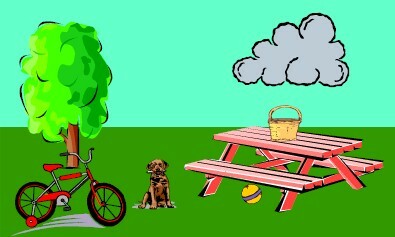 Write sentences to describe where the objects are in the picture. It's on the corner of ______ and ______. 1. I'm at the police station. How do I get to the church? Go straight on Main Street. Turn left on Second Street. Go two blocks. It's on the right. Go straight on Main Street. Turn left on Central Avenue. Go one block. Turn left. It's on the right. Go straight on Main Street. Turn right on Second Street. Turn left on Central Avenue. It's on the right. 2. I'm at the school. How do I get to the movie theater? Turn left onto First Street. Go past the hospital. Go one block. It's on the right. Turn right onto First Street. Go one block. Turn right on Main Street. Go past the post office and the drugstore. It's on the right. Go straight on Central Avenue. Turn right onto Second Street. Go two blocks. It's on the left. 3. I'm in the movie theater. How do I get to the school? Turn right onto Second Street. Go one block. Turn right. Go past the restaurant. It's on the right. Go straight on First Street. Turn left. Go one block. Go past the hospital. It's on the left. Go straight on Main Street. Turn left on First Street. Go one block. Turn right onto Central Avenue. It's on the right. 1. The school is next the supermarket. 2. The beaty shop is opposite the bank. 3. The library is in front the park. 5. The movie teater is on the right. 4. The church is behin the hospital.